One of the highlights of my year is the non-credit class I teach through the University of Tennessee: “Planning Your European Vacation.” Since we returned from our 14-month trip from Europe in 2005, I’ve taught the class five times. Although there are usually some experienced travelers in every group, most participants are planning their first or second trip to Europe. A few years ago a class member asked about the biggest mistakes I’ve made in my European travels, and I’ve now incorporated this discussion into one of my sessions. After almost 20 years of traveling in Europe, I’ve certainly learned a lot from mistakes along the way. I’m a different kind of traveler than I was when I made my first European trip in 1991. Planning a trip with several destinations that were too far apart, which meant entire days spent getting from one location to another. 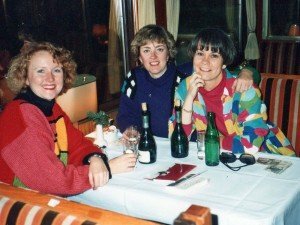 On my first trip to Europe with two girlfriends, we spent five of our 13 days on trains, traveling from one big city to another in four different countries. I’ve learned to cluster destinations more closely together to limit travel time and see and do more during my vacation time. Traveling too quickly and moving to different hotels every day or two. This was our pattern in our first several trips, when we wanted to see everything and try lots of quaint European hotels. On our family’s first 10-day trip to England, we stayed in five different hotels. Charley and I didn’t realize how much time we would spend searching for our hotels, finding parking places, checking in and out, and hauling our baggage into tiny elevators or up several flights of stairs. We’ve learned to slow down and stay longer in fewer places, getting to know a place and its rhythms. We’ve learned that “less” is often “more” when traveling in Europe, and our trips are much more relaxing. Spending way too much money on mediocre meals especially in places with heavy tourist traffic. All we remember about that pizza lunch in Venice ($100) and the gelato in Florence ($27 for three cones) is our shock when we received the bills. Charley once spent over $14 for a beer at the Café le Paix in Paris—although he did enjoy the environment at his sidewalk table looking out at the Opera House. We’ve learned that for good, less-expensive food, eat where locals eat—not places that are mainly there for tourists. We’ve learned to buy food at outdoor markets and groceries, to enjoy picnics and meals cooked in our apartment. We watch for hidden costs, like the “coperto” in Italy. And we’ve learned how to ask “how much?” in every language… and that we can walk away when we look at the prices in the menu and realize it’s more than we want to spend. Failing to read the fine print related to a rental cars, directions or reservations. One of our most expensive mistakes while traveling was putting regular gas in a diesel car. Our car broke down on a day trip to the Salzkammergut in Austria, on a Sunday afternoon the day after Christmas. Kind mechanics rescued us and opened up their car dealership to repair our car, but we ended up with a bill of over $500 and several hours spent waiting in a darkened showroom. On another early trip we drove two hours out of the way to a village of the same name when I didn’t properly check the location of our rental cottage in Burgundy, France. I’ve learned to check and double check the small details, and we always know what type of car we’re driving! Not researching schedules and ticket requirements. 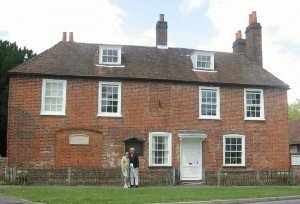 The biggest disappointment of our 2002 trip to England was arriving at Jane Austen’s cottage five minutes after closing time. This was to be one of the high points of the trip, and I was in tears when we weren’t able to go inside, especially after making such a long drive to get there. In 2004 we a hiked a couple of miles to Monte Oliveto Maggiore, a famous abbey in Tuscany, to discover had just closed for three hours at lunchtime. On that same trip, during our four days in Florence, we learned we should have ordered tickets to the famous art museums at least a month before our visit. I’ve learned to carefully check the schedules of any destinations we plan to visit, recognizing that many European sites are closed one or two days a week, have different schedules at different times of year, may be closed at lunchtime, and may have advance ticket purchase requirements. Taking too much luggage, especially when traveling by train. We had a couple of miserable train experiences early in our European travels because we had more luggage than we could easily carry onto the train. I found this extremely stressful! I still remember the indignant look of the woman seated near us on the train from Nuremberg to Munich as we frantically tried to find places to store all our bags. Once in England we had to upgrade to a more-expensive larger car when the car we reserved didn’t have enough space for the three of us and our luggage. I’ve learned to make good choices about the clothes I bring, wear everything at least twice, and always plan to do laundry or handwashing. 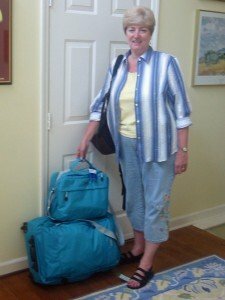 I limit myself to a 26” rolling bag and a carryon I can wear on my back or sling over my shoulder. And I always make sure to have extra space in my bag for the trip over, so there’s room for purchases on the way back. Wearing brand new shoes that looked stylish but weren’t right for walking and that I’d barely worn before the trip. Although I knew better, I did this a few years ago when I went to study French in Aix-en-Provence. I ended up having to walk over a mile from the shuttle bus stop to my B&B with my luggage, which fortunately was minimal. The next morning I was out early, looking for a pharmacy and trying to remember the French word for bandaid (pansement). I’ve learned to set style aside, buy practical shoes for my trips, purchase them several weeks before the trip, and walk in them a lot before I leave. Hopefully you’ll learn something from our mistakes to help plan your own European vacations. And for an ideal trip where you won’t have to worry about making most of these mistakes, consider joining one of our European Experiences trips or trips offered by other members of Slow Travel Tours! Kathy and Charley Wood lead The Luberon Experience, a week-long “slow tour” in the most beautiful area of Provence, France. They also lead two or three European Experience trips every year to other special places in Europe. 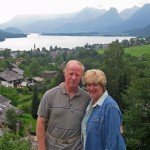 In 2010 they will lead trips in the Salzkammergut area of Austria and the Cotswolds in England. Their 2011 tours will include three weeks in the Luberon (May/June and September) and two weeks in Tuscany (June). Details of their 2011 trips will be posted in May 2010. One of my mistakes – on ANY vacation – is trying to do too much. I tend to forget that it’s a VACATION, not an graduate course in anthropology. I like to travel to a lot of different places, and I always assume that I will never be back to the current destination. So I have to see it all, do it all – eat it all!!!! I forget to just relax and enjoy the place, as I would if I had a day off at home. You really end up experiencing more – and enjoying it more – when you don’t try so hard.